Microsoft Dynamics AX Mainstream Support to End Soon. Didn’t See It Coming? Don’t Panic! Working with Microsoft Dynamics AX? Here is the most important news for you, Microsoft is ending its mainstream support for Dynamics AX 2009 on April 10, 2018. If you have not planned anything yet, it is high time that you must start getting a plan to upgrade and migrate. Every ERP Software Solutions from Microsoft comes along with a life-cycle, here comes an end to the Dynamics AX 2009 & Dynamics AX 2012. First of all, What is Mainstream Support? The support for changing the product design and features based on the requirement is known as the mainstream support. Along with these, the security updates are also included in the mainstream support. When Microsoft ends the mainstream support, the customers can no longer take these actions with the Microsoft Dynamics AX. Now is the time when you should at least find all the consulting resources if there are no other plans yet. The end users of Microsoft Dynamics AX have a challenging task for them. Working with Microsoft Dynamics ERP Solutions isn’t a task that can be done easily or with no stress. Now Let’s Understand the Impact! What roles of an ERP Software will come to end with this? Not only Microsoft Dynamics AX 2009, the mainstream support for Microsoft Dynamics AX 2012 will be ending on October 9, 2018. 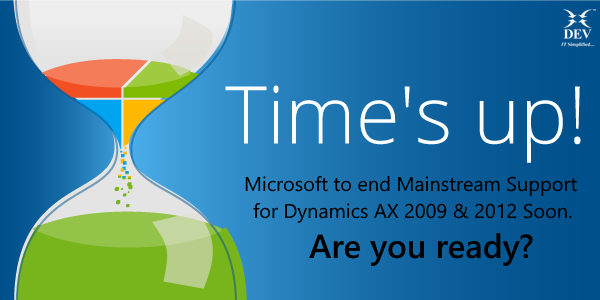 So, the end users of Dynamics AX 2012, stay ready with the update and plan. In this world full of continuous advancements in the technological world, updating with the software is what every company requires. Missing out an update may lead the entire ERP System prone to security threats. When talking about Microsoft Dynamics AX 2009 & 2012, the end users should consult their dynamic partners at the earliest possible. For the Microsoft Dynamics AX 2012 users, it is a great time to update to the Dynamics AX 2012 R3 as its’ life-cycle ends in 2021. Our Dynamics experts can help you with the journey of transition with our flexibility and ability to react quickly to your changing business needs. More than a decade of experience in providing Microsoft Dynamics ERP advisory, acquisition, design, implementation, integration, maintenance and up-gradation services. Click here to know more about our services. Let us help you take the right decision. Schedule a meeting with our Microsoft Dynamics expert. Thank you James for reading our blog. We really appreciate that. Yes, we provide end-to-end services to global clientele. For Microsoft Dynamics ERP, CRM as well as Dynamics 365, we help clients with consulting, developing a custom solution based on their requirements, implementation (on-premise, hybrid or cloud) as well as providing functional and 24×7 technical support. We are a team of 600+ skilled and experienced professionals. Dev Information Technology Ltd. is public listed company on NSE Emerge, headquartered in Ahmedabad, India and having offices in India and Canada. If you any requirement pertaining to Microsoft Dynamics solution, please let me know, I will help you align the our expert team with you. I thank you once again for your time for reading our blog. Stay tuned for further updates.